Take a look at the picture below, showing some tiles at Bayside Boys' School in Gibraltar. What mathematical questions occur to you? Here is a close up of a section of the tiled wall. Does this help you to answer any of your questions? Does it prompt any new questions? Becky is approximately 1.7m tall. 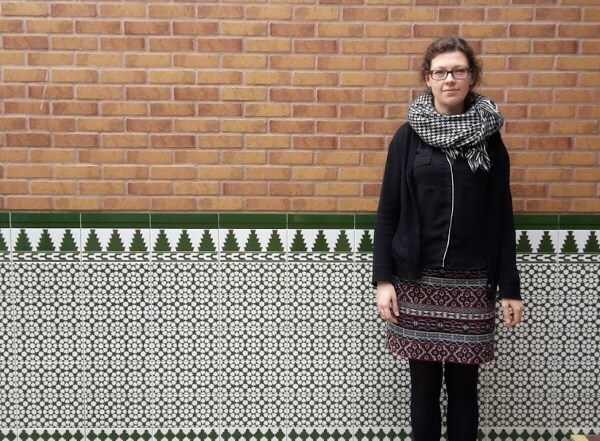 She is standing by the tiled wall. Does it prompt any more questions? 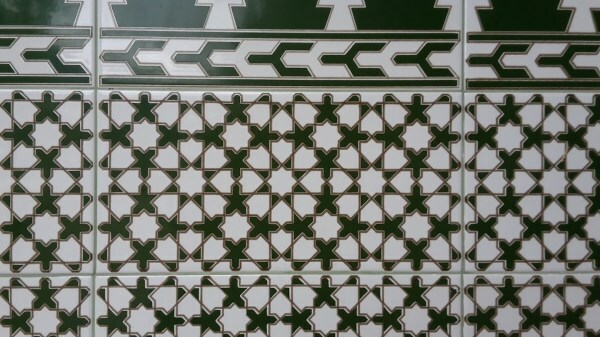 What geometric shapes are there in the tiles? What angles can you work out? Can you recreate a copy of the tile on plain paper? How many rectangular tiles would you need to tile your classroom? The tiles are an example of a type of pattern commonly found in Islamic Art. Rotations. Regular polygons and circles. Circle properties and circle theorems. 2D shapes and their properties. Area - circles, sectors and segments. Pythagoras' theorem. Angle properties of polygons. Symmetry. Tessellations. Reflections.